A historic preservation success story, construction was initially completed on the Hotel Syracuse in 1924. 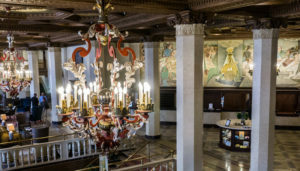 During the following eighty years Hotel Syracuse in its various iterations was well regarded for its grandeur and hosted such well-known guests as Presidents John F. Kennedy and Eisenhower, Charles Lindberg, Elvis Presley, and John Lennon. The hotel succumbed to bankruptcy in 2004, and after a series of unsuccessful revitalization attempts, a new owner, Syracuse native Ed Riley, undertook a $75 million restoration project. The hotel reopened under the name Marriot Syracuse Downtown in 2016. 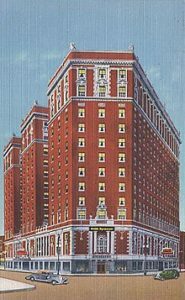 More information about this hotel’s illustrious history is available at Marriot Syracuse Downtown. The Daily Orange. Photographer Aline Peres Martins. Call Marriot Central Reservations at 1-(800) 228-9290 and mention you are calling for the SU Department of Anthropology and Archaeology room block. They will then honor the discounted rate. This rate will be available until the block of rooms sells out or until March 3rd, 2019.